I've loved fuzzboxes on bass since I first heard "Think for Yourself" on The Beatles' "Rubber Soul" LP. Although the first attempts at fuzz bass required the player to use a guitar fuzz that usually eliminated bottom end, over the years many manufacturers have tweaked guitar fuzzes to produce boxes that allow tailoring of the sound for bass. Among the popular units in the 1970s was the Maestro Bass Brassmaster, favored by Chris Squire of Yes but no longer made, although a clone is available. Now Tech 21 has introduced the Red Ripper, a bass fuzzbox that promises a Brassmaster-like tone plus settings for envelope-style synth bass. 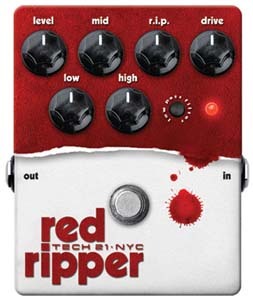 The all-analog Red Ripper responds to the dynamics of your touch: play harder for more fuzz and higher harmonics, ease up for less fuzz and enhanced lower harmonics. The Red Ripper’s R.I.P. "powers your tone from vintage fuzz, to tectonic distortion and into the realms of Brassmaster-style octaver fuzz. Dime the R.I.P. and enjoy the violent stabs of a Moogie-style synth tone. While the Red Ripper can emulate the tones of an envelope filter, the signal is not actually being filtered, so your tone won’t thin out and drop off when the effect is engaged." Active three-band EQ delivers studio-grade tone shaping, while the Level and Drive controls let you find the sweet spot between dirt and volume. There’s a Low Pass Filter switch to compensate for full-range bass systems equipped with tweeters. Buffered bypass and a silent-switching, custom footswitch completes the package. Operates on a 9V battery or optional AC adapter. MSRP: $225. Should be in stores by March 2010.